You will be amazed when you see this stunning Estate on the sparkling shores of Lake Michigan with 440 feet of private sand beach. Attention to detail abounds with custom craftsmanship finishes including hand carved entry door, fireplace mantel, grand staircase and the beautiful tile. The sprawling grounds include in-ground pool, hot tub, shooting/archery range and tennis court. This residence also boasts a magnificent home theater, training room and indoor full size basketball court.To truly enjoy the beauty of this majestic, executive property please enjoy our visual tour. Riverloft Condominium Available!2 bedroom 2, full bath. On suite Master with large walk in closet, spacious bath with beautiful fixtures. Main floor laundry, storage galore including separate private storage space directly across the hall. Elevator, 2 stall indoor parking garage, gathering room, exercise room all located on the Manitowoc River. This beautiful spacious floor plan with incredible views of the Manitowoc River and Lake Michigan is your dream come true. Located in the center of downtown. Relax on your beautiful deck, enjoy the fireworks, festivals, parades and more. Brand new construction! 3 bedroom condo built by Bartow Builders located in the beautiful Woodridge Estates. The condo's master bedroom includes an ensuite bath plus 2 additional full baths. This property boasts high end quality craftsmanship, granite countertops throughout & spacious floor plan. The fully finished lower level is finished with an entertainment room with wet bar & an exercise room. Home includes an attached finished garage & deck with privacy fence. 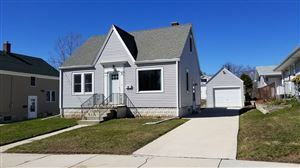 This lovely property is just on the edge of the city of Manitowoc where you can sit back, relax & enjoy the peace and tranquility. Quiet Cul-de-sac in this executive neighborhood is where you will find this charming 3 bedroom home nestled into a beautifully landscaped yard with privacy. This custom built home boast a on suite master bath, upgraded kitchen, family room, living room, additional 1 1/2 baths, Fireplace and so many extras. Finished rec room lower lever. 4 car garage, patio, all appliances included. This property. Move in ready just turn the key!! Executive custom built 4 bedroom, 3 1/2 bath ranch on 2.3 wooded acres with a pond. Home features tiled foyer entrance, vaulted cathedral ceilings in living room along with a beautiful mantled gas fireplace. Desirable open concept kitchen & dining area with oversized island, custom tile, patio door leading to Trek Deck, overlooking the spectacular, professional landscaped yard with pond. Oversized master suite, master bath with tiled floor & walk in shower with custom cabinets. Beautiful walk out lower level with oversized stone gas fireplace & built in bar area, perfect for gatherings & entertaining. First floor laundry & insulated/drywalled attached 3 car garage. Nestled along the East Twin River is this beautiful 5 bedroom ranch with 139 feet of river frontage. This home boast beautiful views with incredible sunsets. 3 full bath, On suite master bath with Jacuzzi tub. Kitchen, family room, library, fully finished lower level and a 4 car garage. You have your choice of the patio or the deck to relax while you watch the sun set over the water. Top notch Port-A-Pier is included. Park your boat and enjoy all this piece of heaven has to offer. To Aspire is to strive toward a goal of higher expectations, Higher service, and raised standards through great effort. Aspire is to be ambitious. This is the foundation on which our Company is built.